Thou fool, that shall say, “A Bible, we have got a Bible, and we need no more Bible.” Have ye obtained a Bible save it were by the Jews? [Why then] murmur ye, because that ye shall receive more of my word? Know ye not that the testimony of two nations is a witness unto you that I am God, that I remember one nation like unto another? Wherefore, I speak the same words unto one nation like unto another. Sounds logical to me. Why would God limit His interactions to just one people? By reading the Hebrew Bible, one gets the impression that the Israelite God was very tribalistic. But in the New Testament, Jesus, and in particular Paul, open up God’s reach to everyone. Why the resistance against new scripture? This Protestant Reformation was in part a reaction against Roman Catholicism, which touted the need for divinely appointed authorities to interpret scripture and bring in new revelations, if needed. Joseph Smith, rooted firmly in the Protestant theology of the day, grew up with the concept of sola scriptura in full force. This doctrine insisted that the Bible as then constituted contained all the knowledge that one needed to know in order to achieve salvation. Tied to this idea was the insistence on the part of some Christian groups that the scriptural canon (i.e. the books that formed the Old and New Testaments) was closed. In other words, they believed that the exact books contained within the Bible (typically the King James Version in that day) were the only books worthy of authority, and any other books were either disreputable and or non-binding with regards to doctrine. When Joseph Smith boldly (and awesomely) proclaimed that the canon was not closed, that the heavens were not silent, it defied this belief. To many, questioning the absoluteness of the scripture canon was effectively undermining the authority of scripture itself. If the Bible alone wasn’t sufficient for salvation and living a Christian life, then what good was it? Does the Bible say its canon has been closed? As an LDS missionary, it was common to encounter potential proselytes with concerns about new or “other” scripture. One argument verse we were trained to refute is found in the book of Revelation 22:18: “I warn everyone who hears the words of the prophecy of this book: if anyone adds to them, God will add to him the plagues described in this book”. People frequently believe Revelations to be the “final” piece of the Bible, thus neatly completing the canon (which was ostensibly determined by that point) and serving as a bookend to everything authoritative God would have to say to us in scripture. To the contrary, we would say. The Bible as we have it today was not even in existence at the time Revelation was written. Not even for at least a couple of hundred years later, actually. So the writer of Revelation couldn’t have been referring to “adding to the Bible”, because there was no Bible yet. He must have been referring to the book of Revelation itself. 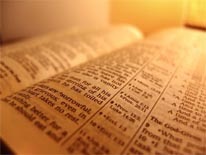 If that didn’t address the concern sufficiently, we’d then point out that Deuteronomy, the fifth book in the Old Testament, contains a similar injunction: “You shall not add to the word that I command you, nor take from it, that you may keep the commandments of the LORD your God that I command you.” If these words, which preceded those in Revelation by perhaps thousands of years, were to be interpreted as opposition to new scripture, then we’d have a lot skinnier Bible. What do those verses mean then? Truly in the presence of God the Father and of the Song and of the Holy Spirit, I adjure and beseech everyone who may either transcribe or read these books, by his believe in the kingdom to come, by the mystery of the resurrection from the dead, and by that everlasting fire prepared for the devil and his angels, that, as he would not possess for an eternal inheritance that place where there is weeping and gnashing of teeth, and where their fire is not quenched and their spirit does not die, he add nothing to what is written and take nothing away from it, and make no insertion or alteration, but that he compare his transcription with the copies from which he made it. These are dire threats—hellfire and brimstone—for simply changing some words of a text. Some authors, though, were fully determined to make sure their words were transmitted intact, and no threat could be serious enough in the face of copyists who could change text at will, in a world that had no copyright laws. It is not uncommon to encounter amateur anti-Mormon literature cite the verse in Revelation, as if that unequivocally answered the question of whether the Bible should be the end-all and be-all of scripture. However, more educated Evangelicals and other Christians often acknowledge the problem inherent in having a doctrine on closed canon: the Bible doesn’t actually mandate it. So to insist on a closed canon, one must rely on extra-biblical interpretations or authority, which totally undermines sola scriptura. For traditions that adhere to this doctrine, the development of scriptural canon is a tough issue to grapple with. The fact is that when early Christians began compiling sacred books, epistles, and other Christian manuscripts, there was great disagreement on which writings were authentic, important, or useful. Dozens upon dozens of unique pieces of literature were candidates for scripture, and different Christian communities held to different collections. Once the community became more organized (sometime around the 3rd century), the need for cohesiveness and unity became more pressing, but there was no easy way to come to a consensus on which writings to reject and which to keep. It is interesting to consider the lists of books that might not be in your Bible but that at some point in the past were considered holy scripture by certain Christian authorities.